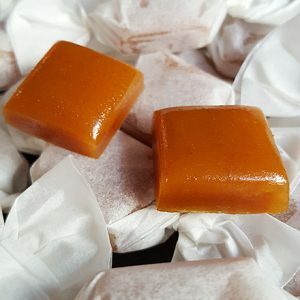 Handmade confectionery made by a small vegan family company in Brighton. Lovingly made in small batches to our unique secret recipe, to create the perfect flavour and chew. 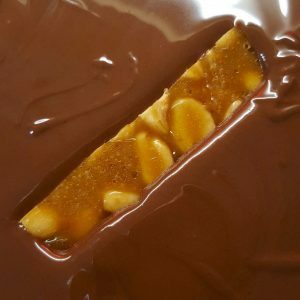 CAN YOU HELP US OPEN THE WORLD’S FIRST VEGAN TOFFEE FACTORY? We’re almost there with our upscaling – we now have premises, all of our machinery is either on order or has arrived and our contractors have just started work making our new ‘Toffee Towers’ ready for food production. However, although we’ve raised more than £100,000 so far, we still need to find an extra £20,000 to match our start-up costs. We’re about to apply for a bank loan for our deficit but being unconventional as ever, we first wondered if any of you lovely people who have been so enthusiastic and supportive of us would be able to help us by offering us a small (or larger!) loan which we would pay back with a healthy rate of interest in 2020. And of course we’d also throw in some naughty goodies too! We would also honour you by having your name on a plaque in our factory as a ‘founding supporter’ and thank you on a ‘roll of honour’ on our website (unless you’d prefer anonymity). We would be grateful for loans of ANY amount you feel prepared to provide and we will issue you an acknowledgement. We will pay you back with 5% interest by mid 2020. Throughout 2018 we’ve been working hard to be able to make big changes in 2019, and over the next few months we’ll be busy getting our shiny new factory up and running! Finally! This means big changes for us, which will allow us to make so much more stock, even enough to start selling wholesale to vegan-friendly shops, so our naughty treats could soon be in your local shop. It might be a bit of a bumpy ride for a few months, and although we want to run our shop as ‘business as usual’, orders may take a little longer to get out to you while we’re also working on the new premises. and to create our own toffee wonders! *With the exception of our Malt Lava which has c.60-80ppm of gluten, so cannot be labelled as Gluten Free. 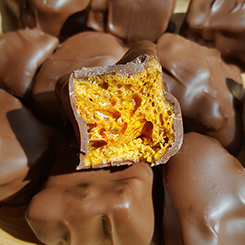 Make no mistake, our confections are high quality hand crafted delicacies, but rather than packaging them up like an exclusive and over-priced ‘Artisan’ or ‘Speciality’ treat, we want our sweets to be like you’d get in a sweet shop, nothing ‘exclusive’, just ‘normal’; because we’re on a mission to make dairy-free confectionery the normal! “That’s a flavour I haven’t tasted in a long time!” Elizabeth. “I just tried a Smootch and wow they are amazing.” Cheryl. “You would never know the difference!” Mat. “I’ve been missing toffee so much!” Beki. 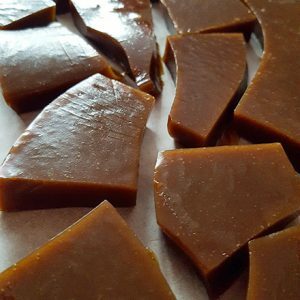 “Tastes just like dairy toffee. If you did a taste test you couldn’t tell the difference!” Debbie. 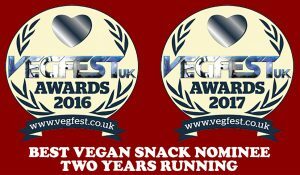 “That’s the best new product at the Brighton VegFest!” Sam. “The most realistic ‘alternative’ I’ve had!” Sue. “Bravo! Shake my hand good sir!” Kate. We do our best to source the most ethical ingredients, From unrefined fair traded sugars to organic fair trade highest quality extracts. Our chocolate is UTZ accredited for ethical, sustainable farming, and the margarine we use is RSPO certified, only using Palm from sustainable crops. 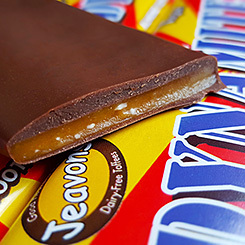 We only use the best of ingredients to ensure that our toffees aren’t just a great dairy-free ‘alternative’, but are great toffees!